And other Amazon sites around the world carry all Paulette’s books. ALL PROFITS GOING TO the first and only no-kill animal shelter in Ventura County, CA., Santa Paula Animal Rescue Center http://www.santapaulaarc.org/ ; The Canine Adoption Rescue League http://www.carldogs.org/ (http://carldogs.org/purchase-name-ben/); and to various rescues helping to get dogs out of kill shelters. BIO: Paulette Mahurin is an international best selling literary fiction and historical fiction novelist. She lives with her husband Terry and two dogs, Max and Bella, in Ventura County, California. She grew up in West Los Angeles and attended UCLA, where she received a Master’s Degree in Science. 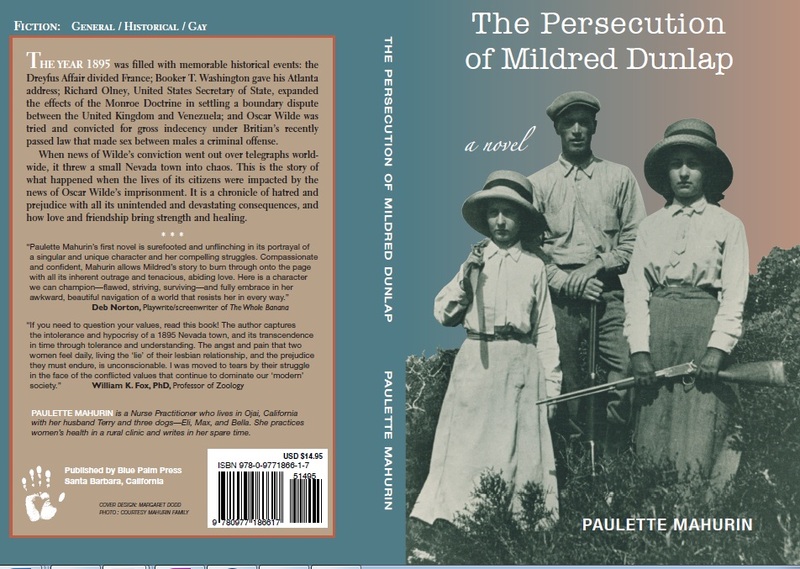 Her first novel, The Persecution of Mildred Dunlap, made it to Amazon bestseller lists and won awards, including best historical fiction 2012 in Turning the Pages Magazine. Her second novel, His Name Was Ben, originally written as an award winning short story while she was in college and later expanded into a novel, rose to bestseller lists its second week out. Her third novel, To Live Out Loud, won international critical acclaim and made it to multiple sites as favorite read book of 2015. Her fourth book, The Seven Year Dress, made it to the bestseller lists for literary fiction and historical fiction on Amazon U.S., Amazon U.K. and Amazon Australia. Her fifth book, The Day I Saw The Hummingbird, was released in 2017 to rave reviews. Her sixth novel, A Different Kind of Angel, is due to be released in the summer of 2018. Semi-retired, she continues to work part-time as a Nurse Practitioner in Ventura County. When she’s not writing, she does pro-bono consultation work with women with cancer, works in the Westminster Free Clinic as a volunteer provider, volunteers as a mediator in the Ventura County Courthouse for small claims cases, and involves herself, along with her husband, in dog rescue. Profits from her books go to help rescue dogs from kill shelters. All new friends and visitors are welcome. Have a look around and please feel free to enter the conversations. Such a beautiful mission ! A mission that you are doing very well. Always in my heart, my sweet unforgettable sis. Your creations are very nice. Nice to meet you and thank you for sharing. Paulette–I finished reading this book and left a glowing review at Amazon! Thank you! And the same to you and your family! A Blogger’s Hello from Seminole, Florida! Just a short note of Hello and Thank You for comments, blog postings, or recommendations/links to other pages. For me, the whole process of writing and postings is painstaking, yet rewarding. Writing is never easy, even for this old retired English teacher, believe me. So please continue to “Write On!” –and continue to look at one of my stories occasionally. PS: The work you are doing is outstanding. Yet, I am a cat lover mostly…. Congratulations on the publishing of your book!!! Awesomeness! Many warm hugs you too. Hello my friend! I have been thinking of you and praying for you and everyone who lives in California! I hope that you are okay and that you did not lose any property. We sit from afar and watch the news on television or the internet and it just seems so devastating and sad. I’m so happy to hear from you and that you are ok!! It is so hard to understand that kind of devastation…and the only good thing about it is the way people come together…and forget about their ego-centric concerns- to look out for their neighbors…to pull together to help those in need. I’m so happy to hear that that is exactly what is happening. It shows beauty in an otherwise ugly situation. Yes, it should be more hospitable then. Yes, long flight. New York’s an exciting city with things going on 24/7. Enjoy!